Few weeks ago Ubuntu 11.04 (Natty Narwhall) has released with new environment (unity desktop) which actually make some ubuntu users feel strange with ubuntu 11.04 new interface. Indeed some part of desktop looks different than previous but not entirely bad, I promise that you'll fall in love `soon` when you know more. 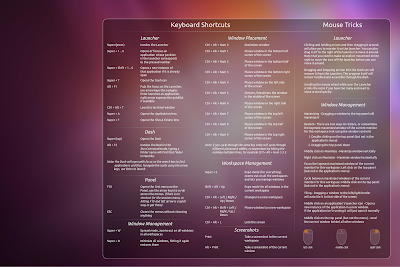 Here are unity keyboard shortcut and mouse trick on Ubuntu 11.04 Natty Narwhall, hope this will help you to feels comfort and familliar with this new environment. Hold Super - Invoke the Launcher. Hold Super, then 1 or 2 or 3 and so on until 0 - Open or focus an application. The number corresponds to the location of the icon on the launcher from top to bottom. Super-T - Open the rubbish bin/trash can. Alt-F1 - Put keyboard focus on the Launcher, use arrow keys to navigate, Enter launches an application, Right arrow exposes the quicklists if an application has them. Ctrl-Alt-T - Launch a terminal window. Alt-F2 - Invoke the Dash in a "special mode" to run a command. Typing in a Folder Name will find that folder in Nautilus, you can also use ~ as a shortcut in the field. Super-W - Spread mode, zoom out on all windows in all workspaces. Ctrl-Alt-Numpad 7 - Place window in top left corner of screen. Ctrl-Alt-Numpad 8 - Place window in top half of screen. Ctrl-Alt-Numpad 9 - Place window in top right corner of screen. Ctrl-Alt-Numpad 4 - Place window on the left side of the screen. Ctrl-Alt-Numpad 5 - Center/Maximize the window in the middle of the screen. Ctrl-Alt-Numpad 6 - Place window on the right side of the screen. Ctrl-Alt-Numpad 1 - Place window in the bottom left corner of the screen. Ctrl-Alt-Numpad 2 - Place window in the bottom half of the screen. Ctrl-Alt-Numpad 3 - Place window in the bottom right corner of the screen. Ctrl-Alt-Numpad 0 - Maximize window. Super-S - Expo mode (for everything), zooms out on all the workspaces and lets you manage windows. Shift-Alt-↑ - Expo mode for all windows in the current workspace only. Ctrl-Alt-← / → / ↑ / ↓ - Change to a new workspace. Ctrl-Alt-Shift-← / → / ↑ / ↓ - Place window to a new workspace. Ctrl-Alt-L - Lock the screen. Maximizing - Dragging a window to the top panel will maximize it. Middle click on the top panel (but not the menu) - send the current window behind all other windows. 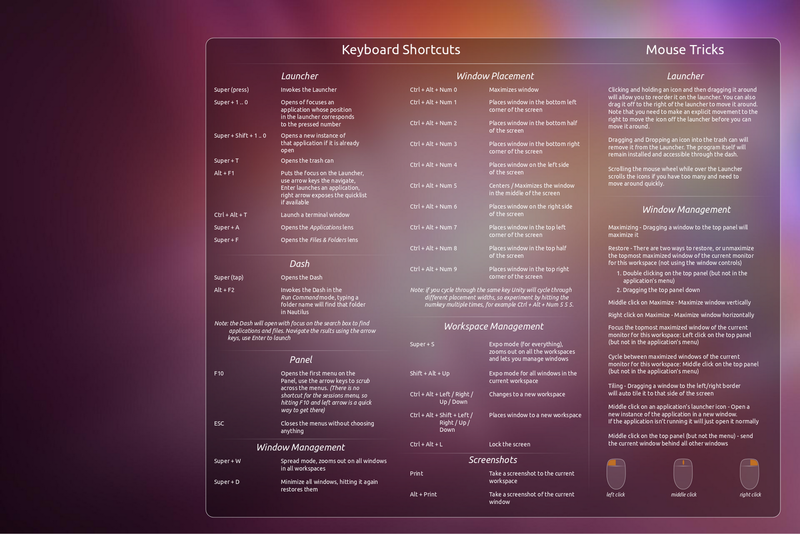 To make you quickly to memorize, you can download Ubuntu 11.04 Unity keyboard shortcut wallpapers here.